Today most Sheets and Plates shipped as Mil Runs. Usually 1350 mm width in all thicknesses. Commercially Pure Grade 1, 2, 3 4, 7 and 11 as well as Grade 5 custom made within 4-6 weeks. 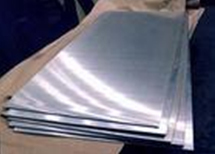 Download the general Titanium Sheets and Plates Stock List. Aside standard sizes You can order with Titanex tight tolerances, special surface requirements and more!